A bicyclist casts a shadow on Blair Dr. in Normal. 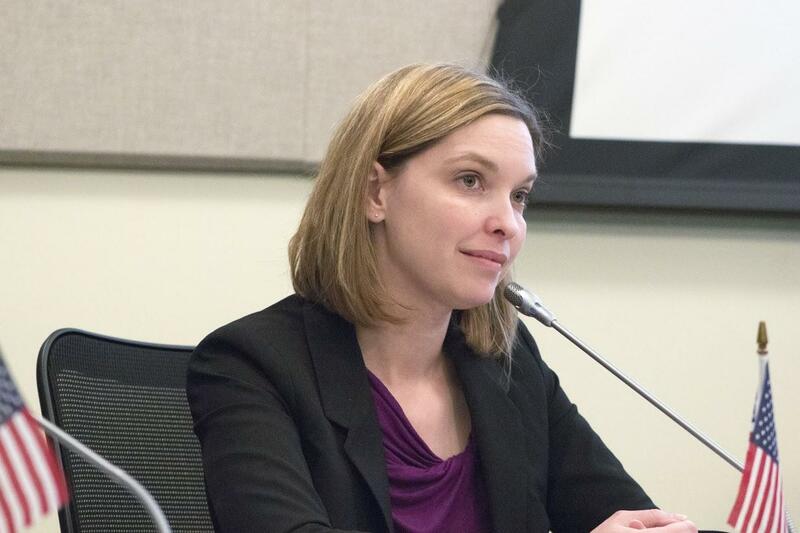 A complete streets ordinance could be discussed as early June 20 at a Bloomington Council "committee of the whole" meeting, according to Mayor Tari Renner. Renner said 4th Ward Alderman Amelia Buragas has been on the vanguard of a complete streets policy for the city and he added she's hoping the council prioritizes the issue and moves forward. Town of Normal City Manager Mark Peterson said the town would take action after Bloomington, probably before the end of summer. According to the National Complete Streets Coalition website, complete streets are "designed and operated to enable safe access for all users." With complete streets, "people of all ages and abilities are able to safely move along and across streets in a community, regardless of how they are traveling." Bloomington 4th Ward Alderman Amelia Buragas. "One of the top complaints I hear from people in older neighborhoods, that do have through traffic, and no one's opposed to that. But the concern is that traffic moves very quickly through those neighborhoods," said 4th Ward Alderman Amelia Buragas. "Streets are not designed in a neighborhood friendly way that reflect the fact that people live there, that people walk up and down the streets, that people want to be able to ride their bikes up and down the streets, that transit is a growing part of our community, and they want to cross the street safely." Buragas said the impetus for the policy push comes from Bloomington's Comprehensive Plan, which recommended among other things, the adoption of complete streets. "To many people on council, this is a very good first step in saying we are going to adopt everything within that plan and this is a way to get started, " said Buragas. "It's not just going to sit on the shelf. We're going to make it happen." Town manager Peterson said Normal has been following the principles of a complete streets policy for years. "We've informally adopted a complete streets policy, but the council has asked us to develop a formal policy for their consideration," said Peterson. "We've been working closely with Bloomington, so at the end of the day both policies will be, if not identical, pretty darn close." Peterson said going forward, when designing new streets or reconstructing existing streets, the town would continue to take a more holistic approach and look at all modes of transportation, not just cars and trucks. He also said Illinois State University students contribute to heavy sidewalk use, and complete streets could mandate wider sidewalks to accommodate foot traffic along roadways. Public health officials often cite incomplete streets as a contributing factor to rising obesity rates. Bloomington Community Development Director Tom Dabareiner agrees. Dabareiner calls many destinations in Bloomington "auto dependent." "Most communities that evolved over the same time frame as Bloomington have a similar dependency. It's just a question about what you do after that and really making complete streets," said Dabareiner. Sidewalks in good shape, with stops along the way, delivering walkers to important destinations, like grocery stores or health care facilities can promote walking, increased physical activity, and work toward reducing obesity rates according to McLean County Health Promotions Manager Nicole Aune. Bloomington Mayor Tari Renner describes municipal streets as "automotive centric." At a recent bicycling event, Renner urged those attending to contact their alderman to express support for a complete streets ordinance. "It's really hard to get a 9-0 vote on our council," said Renner. "I just wanted to make sure people who are really committed to this don't forget to contact their city council members. We're going to hear from people who seem to be against everything since the invention of the wheel." "I think it's just a mater of education. 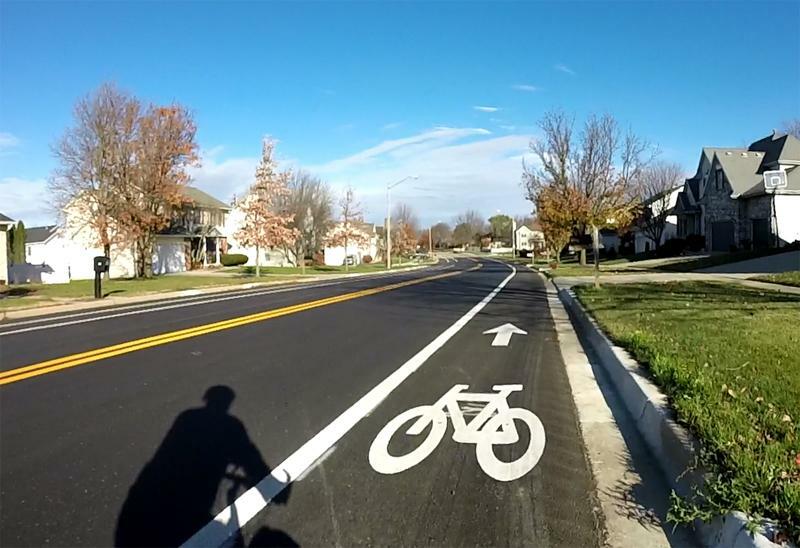 People who are knowledgeable about what complete streets are trying to accomplish are very supportive," said Buragas. "Where we run into difficulty is where there are misunderstandings or where some things, that are assumptions, turn out not to be true. For example, there are some number people who think bicycles are more appropriate on sidewalks versus streets. But when you start explaining the data out there to them that the safest place for a bicycle is in the street, especially when it's in a protected bicycle lane, they begin to see things differently. So the more that we can educate and explain what these practices are and the benefits they provide, the more support they get. Especially keeping in mind that complete streets does not mean that we're suddenly going to have bad traffic or gridlock." Editor's note: Mike McCurdy, who reported this story, is on the Connect Transit Board of Trustees and on the board of bicycle advocacy organization Bike BloNo. Both organizations have had conversations with officials, including sources in this article, about a complete streets policy and both organizations' customers or members would potentially benefit from such a policy, if enacted. A new study says the largest single chunk of bicycle versus auto accidents in Bloomington Normal happen to bicyclists who are using sidewalks. Michael Gorman of the advocacy group Bike BloNo says it's safest for cyclists to behave like motorists and follow the rules of the road on the streets because cyclists are more visible to people around you. Gorman says bikers are most visible when they are behaving like motorists and following the rules of the road, but car drivers may not notice bikers when the head into an intersection from a sidewalk. While some people ride recreationally, an increasing number are using their bicycles to get to work, the store, and doctor. The National Household Travel Survey showed that the number of trips made by bicycle in the U.S. more than doubled from 1.7 billion in 2001 to 4 billion in 2009. 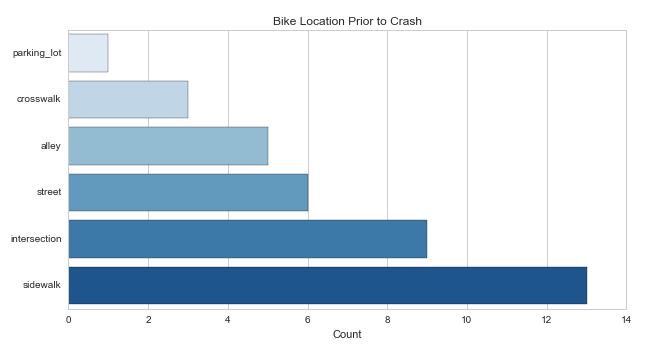 Bike BloNo, a Bloomington-Normal bicycle advocacy organization, recently helped compiled statistics to see where, and when, it's safest to ride your bike.